Third year Plant Science student Bryony Gardner shares her experience of developing the University’s Biodiversity Action Plan. Following on from a successful bid into the Environment Initiative Fund, I was part of a project running throughout the summer to help understand, protect and promote the biodiversity of Sutton Bonington campus. Home to the School of Biosciences and the Vet School, Sutton Bonington is a mature landscaped campus, which also includes an Arboretum of unusual tree species. Its countryside location makes for a diverse range of wildlife visiting the campus and its surrounding areas. Whilst anecdotally there’s always been lots of wildlife to see at Sutton Bonington, formal work to survey and analyse the campus was needed. I was recruited to work alongside ecological consultancy EMEC (an arm of Nottinghamshire Wildlife Trust) to help with surveying and bringing together a report. The development of the Biodiversity Action Plan for Sutton Bonington campus will not only detail how the University can protect and improve current habitats, it will help to ensure that campuses remain as much a home for wildlife as they are for people. We conducted surveys across the campus in the evening hours when the site is a bit quieter. 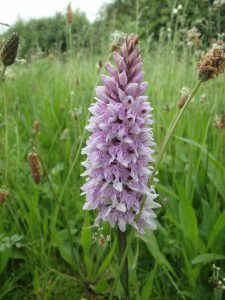 As well as the formal surveys we saw hares and barn owls by the new Dairy Centre at the farm, lots of bats around buildings, and a common spotted orchid in flower on the fields behind the Vet School. Working alongside EMEC, it was invaluable having the insight of experts in the ecological field to identify different species. When not conducting surveys on campus I was based in the offices of the Nottinghamshire Wildlife Trust in Nottingham alongside the team. My course, Plant Science, has more of a focus on lab work, so it was really interesting getting stuck into fieldwork and surveying techniques. Find out more about the wildlife that shares our campuses on Wednesday 14 November 7-9pm, Trent Building, University Park. Email BW-FOUP-Events@exmail.nottingham.ac.uk for details.